What to do about the plastic planet? The seas are steadily filling up with plastic, and it’s vital to find ways to address the problem. One way to do this is to move away from plastic usage towards more sustainable, eco-friendly materials. And that’s just what Indonesia-based company Evoware wants to do. Their proposed alternative? Seaweed. Indonesia is the world’s second-worst offender in terms of dumping plastic into the sea. 90% of their plastic ends up in the ocean. And 70% of that waste comes from food and beverage packaging. The problem, clearly, is a big one. Indonesia is also the largest producer in the world of seaweed. Seaweed farming is a big industry in the country, but its size has not translated to great economic conditions for the farmers themselves. Many of the producers of this major export live in poverty. Evoware hopes that their scheme could contribute to solving both of these issues. 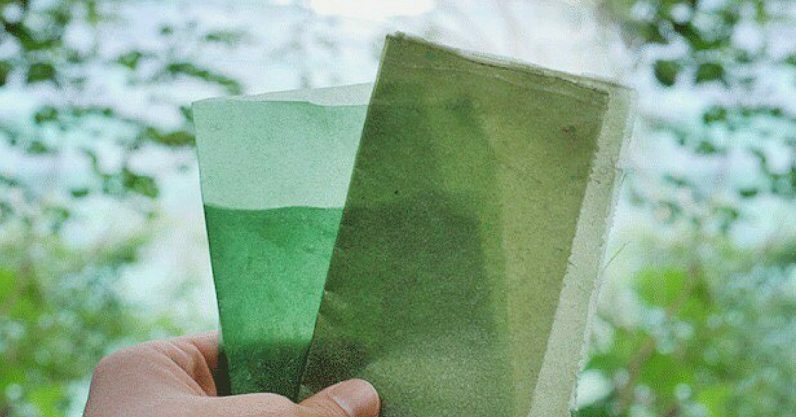 They want to work with the country’s seaweed farmers to create biodegradable packaging from their produce. According to them, it could not only reduce plastic waste in the country but provide a big boost to the livelihoods of Indonesia’s impoverished farmers. If that already sounds too good to be true, the packaging itself has its own practical wonders. Evoware isn’t aiming to replace all plastic usage with seaweed. Obviously, it wouldn’t be the right material for sturdier applications. Instead, they’re focusing on smaller products such as food sachets and wraps and packaging for other small products like bars of soap. For these purposes, they’ve created two varieties of seaweed-based material. One is biodegradable and designed for use with non-food products. Unlike plastic, consumers don’t need to worry about where it will end up after use. The other variety is the really interesting one. Designed for use with food products, it dissolves in warm water and is completely edible even in its non-dissolved state. Rather than pouring the contents of a seasoning sachet into your noodles, you can simply throw in the whole thing. You can leave your tea-bags in since they’ll simply dissolve anyway. And if you receive a burger wrapped in the edible material, you can either take it off or simply bite straight through. Evoware says the seaweed-based bioplastic doesn’t taste like much. In fact, it’s almost tasteless and odorless. And apparently, it’s pretty good for you, too, containing high amounts of fiber, vitamins, and minerals. So eat and drink away! A lot needs to be done to deal with plastic waste across the world today. But technologies like this, which create a synergy between environmental conservation and personal convenience, are always steps in the right direction. Can we solve environmental issues while continuing to improve the quality and convenience of our everyday lives? Anything is possible. Read next: TNW's Big Spam: Can we sniff your meat?